Developer(s): Bally Midway Mfg. Co. 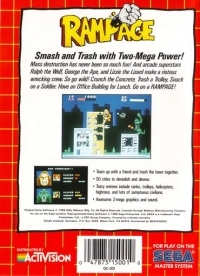 Box Text: Smash and Trash with Two-Mega Power! 10-13-2015 herkamur Box Text Smash and Trash with Two-Mega Power! Mass destruction has never been so much fun! 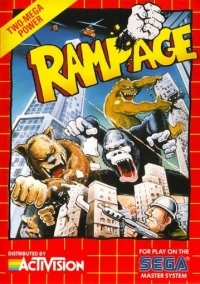 And arcade superstars Ralph the Wolf, George the Ape, and Lizzie the Lizard make a riotous wrecking crew. So go wild! Crunch the Concrete. Trash a Trolley. Snack on a Soldier. Have an Office Building for Lunch. Go on a RAMPAGE! This is a list of VGCollect users who have Rampage in their Collection. This is a list of VGCollect users who have Rampage in their Sell List. This is a list of VGCollect users who have Rampage in their Wish List.